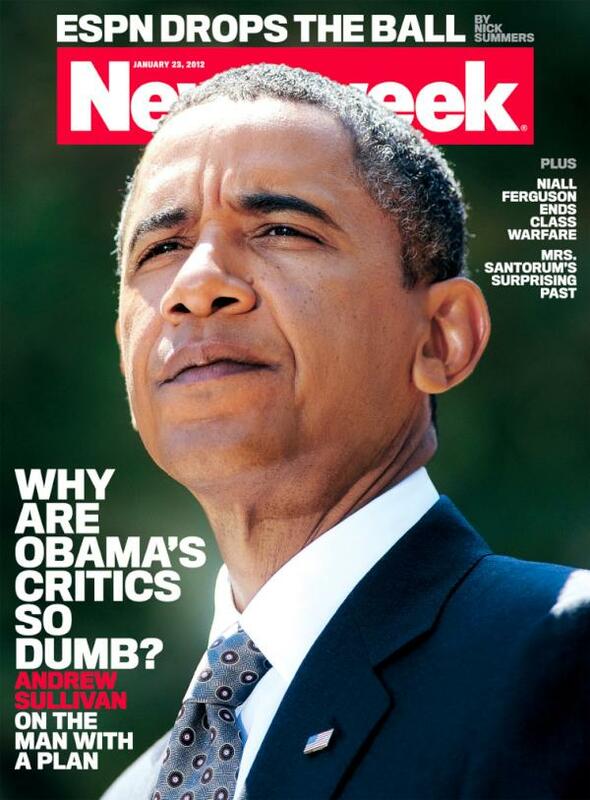 The above cover of Newsweek, asking “Why Are Obama’s Critics So Dumb?” seems unnecessarily provocative. It does not even portray Andrew Sullivan’s article accurately, which is more about how smart he believes Obama to be than directly insulting his critics. Still, we could see where conservatives would object, but one would think they might want to use a little intelligence in their response. Under Bush, new policies on taxes and spending cost the taxpayer a total of $5.07 trillion. Under Obama’s budgets both past and projected, he will have added $1.4 trillion in two terms. Under Bush and the GOP, nondefense discretionary spending grew by twice as much as under Obama. Again: imagine Bush had been a Democrat and Obama a Republican. You could easily make the case that Obama has been far more fiscally conservative than his predecessor—except, of course, that Obama has had to govern under the worst recession since the 1930s, and Bush, after the 2001 downturn, governed in a period of moderate growth. It takes work to increase the debt in times of growth, as Bush did. It takes much more work to constrain the debt in the deep recession Bush bequeathed Obama. The conservative movement is based upon visceral opposition to Obama but no longer really stands for anything meaningful. If you support a market system, lower taxes for most Americans, fiscal responsibility, and economic recovery, the facts overwhelmingly support Obama over his conservative opponents. If you believe the right wing rhetoric blaming Obama for the deficit or the state of the economy, at the very least you are misinformed. I’ll leave it to Newsweek to be more explicit regarding such people.